One question has always bugged me, all the way back since high school chemistry. What did the two rows of elements below the periodic table do to deserve their forgotten place? Those elements are called the f-block elements, the inner transition metals. They’re actually a piece of the sixth row (or period) of the periodic table and belong between the second and third columns (or groups) — but scientists moved them to save space. These elements have features absent from many of the other elements: some are magnetic, half are radioactive, and some can only be crafted by artisan-scientists in a lab. You’ve probably overlooked most of them, too — who’s ever heard of thulium? The F-Block blog will let this rag-tag cadre of elements luminesce from the depths of the periodic cave they’ve been tossed in. But before that, I should tell you what the periodic table is. The periodic table is like the contour map in the back of history class, the list of all of chemistry’s building blocks with the properties that make them unique. Each element has a label: one or two letters alongside their atomic number 1 through 118, representing the number of protons in the atom’s positively charged core. Since atoms have no charge, as the number of positive protons increases one by one so does the number of negative electrons surrounding the center. If an atom was a Broadway show, you can think of the nucleus as the stage and the electrons filling energy levels like patrons filling seats in the audience. The bigger the production, the more people will come to the show. The spectators will fill up the very front row first, and similarly, the electrons fill up the best seats around the nucleus — the s orbital. Once the front rows start to fill, you see patrons begin to take their seats in the mezzanine, one level up. That would be electrons filling the p orbital. Eventually, some patrons will start to take their seats in the balcony as well, which is even larger than the mezzanine. That’s the electrons filling the d orbital. Finally, folks begin to file into the nosebleed seats, as high up and far away from the stage as possible. Those electrons are sitting in the f orbital. An element’s location on the periodic table is based on where the last electron to get to the performance is sitting. If that spectator is in the best seats — the s orbital — the atom is in the s-block, the first two columns of the periodic table. If the last spectator to arrive is sitting in the p orbital, then you’ll find the element in the p-block, which is made of columns 13 through 18. If the spectator’s seats were in the third-best balcony — the d orbital — the element is in columns 3 to 12. And if the last electron-spectator to arrive was sitting way up in the nosebleeds that element also gets the worst seats in the periodic table, in the f-block. So, why f? Well, when you add energy to an atom, it releases a characteristic pattern of light. 19th century physicists named the four different shapes they saw sharp (s), principal (p), diffuse (d) and fundamental (f). 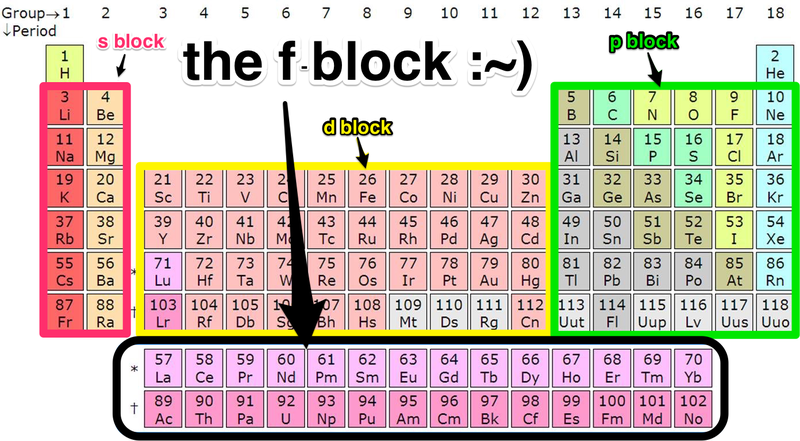 But chemistry students don’t treat the f-block elements the way their fundamental name implies. The f-blockers have to park as far away from the theater as possible and eat hot dogs from cramped seats and watch the show through binoculars while the other elements get to live the life of luxury. Think of this blog as American Idol showcasing underdogs, but instead of discovering Kelly Clarkson, I’ll, uh, tell you about uranium and neodymium.